I write this blog to share some of the ideas from my book Chess Structures, published earlier this year. Each blog posts expands upon some of the concepts shown in my book, by analyzing a recent game amont strong players. 2015 US Junior Closed Championship, July 7th, 2015. If 16… f4 17. Bf2 Bf6 18. h4 Bd8! rerouting the bishop to a more convenient diagonal, but after 19. Rc1+= White maintains a risk free advantage. 18.Be2 the alternative 18. g5!? Bd8 19. h4 is similar to the game 18…b5 gaining some space in the queenside, and allowing the bishop on c8 to move, but also turning the b-pawn into a permanent weakness. 23…Bc8 24. Bd1 Bh3 25. Rg1 Rb8 26. Be2 Bd7 27. Rc1 a5?! again, Black’s ‘active’ moves in the queenside play against him, now the b5-pawn has lost support. It was better to wait passively with 27… Be8 though after 28. Rb1 Nd7 29. a4 bxa4 30. 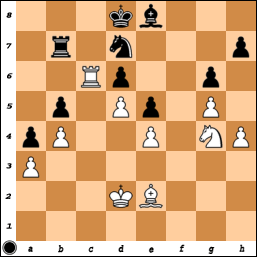 Nxa4 += White stays in control. 28. a3 Kf7 29. Rb1! 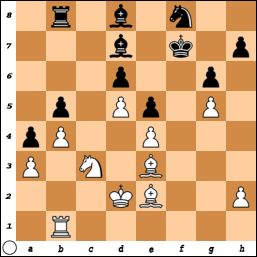 indirectly pressing against the b5-pawn. Now White has a big advantage. 29…a4 this move was necessary sooner or later. 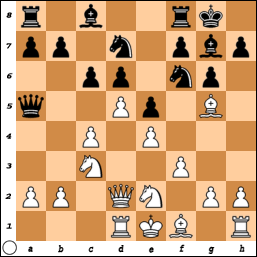 Now the b5-pawn, and consequently the a4-pawn are seriously vulnerable. In case of 29… axb4?! 30. axb4 only White will benefit from using the a-file. The waiting move 29… Kg8 can be met by 30. Kd1! and now the b5-pawn is under attack. 30. 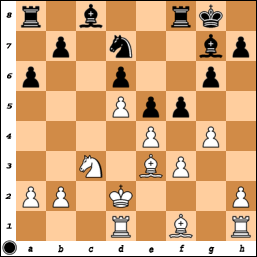 Nd1 White can now shuffle his pieces around, to find the optimal locations for a decisive strike 31…Be8 31. Rc1 Ke7 32. h4 Nd7 33. Nc3 Nf8 34. Rf1 Rb7 35. Nd1 Nd7 36. Nf2 Bb6?! Overall, it was a great positional win by Liang Awonder, I am sure he knew the structure granted him a substantial strategic advantage in the ending, and this is why he was eager to trade queens early in the game. 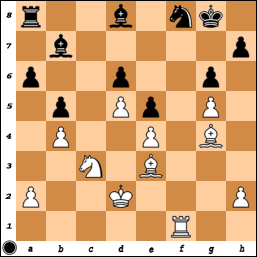 His better understanding of the structure allowed him to obtain a relatively easy, and very instructive victory. Feel free to leave comments, suggestions or questions. If you liked this blog, become a follower, I try to publish at least two instructive articles per month. This entry was posted in Uncategorized on July 18, 2015 by Mauricio Flores.